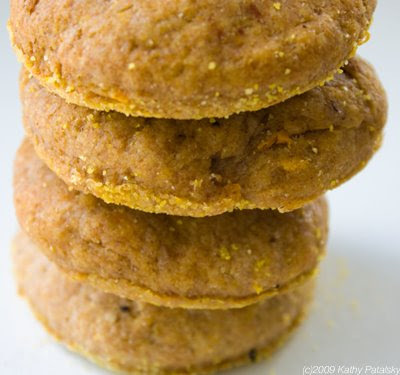 Spelt Sweet Potato Biscuits. Cornmeal Crusted. Vegan. Sweet Potato Habit. If you know me at all, you know my sweet potato addiction. Creamy rich garnet orange sweet potato flesh makes me weak in the knees. So what's even cozier than a bowl of mashed sweet potatoes? 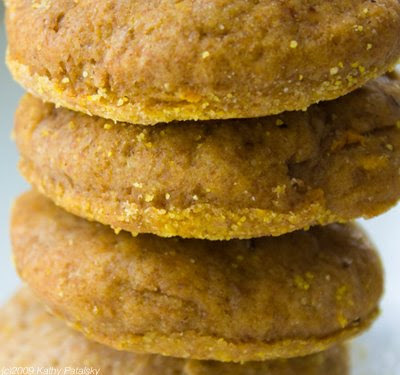 A warm flaky spelt flour sweet potato biscuit of course!! At First Bite. 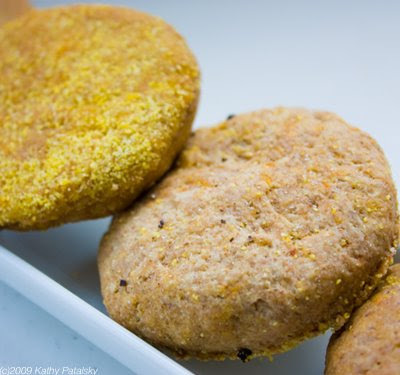 My first really good sweet potato biscuit was at a little cafe somewhere in Santa Cruz California when I was like twelve. Probably not vegan. Then I had an amazing encounter with a vegan sweet potato cheddar chive biscuit in college. That was amazing. 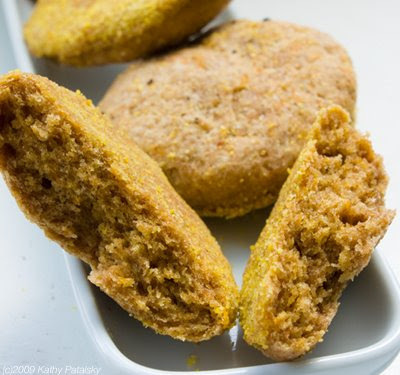 And then I discovered Diamond Organics mail-order vegan sweet potato biscuits. I think I order about a dozen of those every season. Love them. But then I discovered spelt biscuits and decided to sweet-potato them. The result? 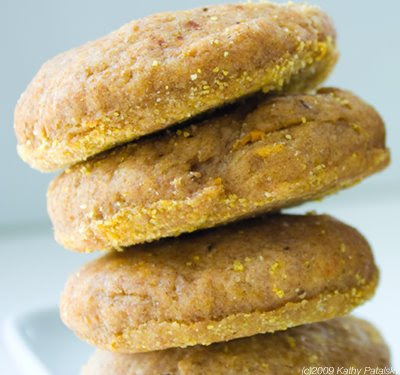 My delicious Spelt Sweet Potato Biscuits with a cornmeal crust bottom. So cozy you'll think your mom made them...but you made them! Combine dry ingredients (spelt flour, flaxseed meal, baking powder, salt, pepper, cinnamon) in a large bowl. Add coconut oil and warm water. A drier than normal dough is good at this stage-the sweet potato will hydrate it a lot. Next, knead in the sweet potato gradually. You may also want to add a bit more flour. Once all the potato is kneaded into the dough you can begin using your fingers to press out the dough into a 3/4 inch thick circle. After you cut your biscuit, using a pastry brush, brush a bit of 'bottom glaze' on the bottom of the biscuit, then dip it gently in the cornmeal. Then lay it on the parchment paper. Continue this until all the dough is used. 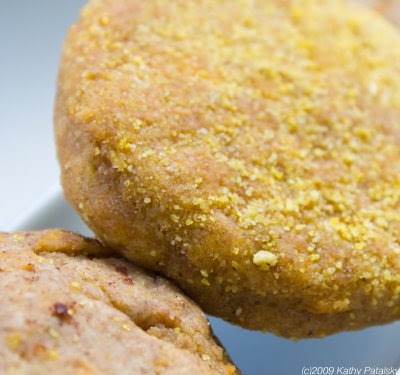 Before sticking in the oven, brush each biscuit with a dab of leftover bottom glaze and a dab of coconut oil. Sprinkle a bit of salt and/or cinnamon of the tops of the biscuits as well if you'd like. Bake in a preheated to 375 degree oven for 12 minutes. For an extra crisp bottom-lay the baked biscuits directly on the oven rack for an additional 3 minutes of baking.